This report, designed for the public, summarizes the findings in CCE’s detailed report to Congress dated May 6, 2004 on the performance of the DC child welfare system. It contains findings and analysis on the city’s compliance with the federal and DC Adoption and Safe Families Acts and the DC Family Court Act. It concludes with a list of recommendations for improvement as well as a list of issues requiring further study. This is CCE's second public progress report on DC's child welfare system. This report is issued at the direction of Congress who in early 2003 provided CCE with funding and a mandate to "Continue independent oversight... [of the system and to provide]...an annual report to Congress on the implementation of the DC Family Court Act of 2001 and the [federal] Adoption and Safe Families Act of 1997 (ASFA)." This report examines the progress made by the DC criminal justice system to implement the 27 recommendations of the Council for Court Excellence’s 2001 study, entitled A Roadmap to a Better DC Criminal Justice System. Two Years Down the Road found that progress had been made to re-engineer misdemeanor case processing, but that felony cases were being processed much the same way as reported in 2001. This report has two purposes: a) to increase public accountability of the District of Columbia's child abuse and neglect system, and b) to increase the community's understanding of that system. This is the CCE's first public report on the progress made by the leaders of the DC child welfare system to bring the District of Columbia into compliance with the federal and local Adoption and Safe Families Acts ("ASFA"). Please call 202.785.5917 to order over the phone. The court community observers project used trained community volunteers to observe individual DC Superior Court criminal court hearings and related court functions during the spring of 2002. Volunteers recorded their observations and the Council for Court Excellence published the major findings in this report to the courts and to the community. Please call 202.785.5917 to order over the phone. Practical recommendations by CCE to improve the civil case trial process in the DC Superior Court, with an emphasis on the court's alternative dispute resolution program. The report examined the implementaion progress of a prior CCE civil case processing study and found that the CCE recommendations adopted by the Superior Court in the early 1990s were working well and had significantly reduced the time to disposition of most civil cases. The court community observers project used trained community volunteers to observe individual DC Superior Court civil court hearings and related court functions during the spring of 2001. Volunteers recorded their observations and the Council for Court Excellence published the major findings in this report to the courts and to the community. Please call 202.785.5917 to order over the phone. Final report of the Council for Court Excellence District of Columbia Grand Jury Study Committee. Report contains 23 law reform and grand juror quality of life recommendations to improve the grand jury systems in Washington, DC. Please call 202.785.5917 to order over the phone. 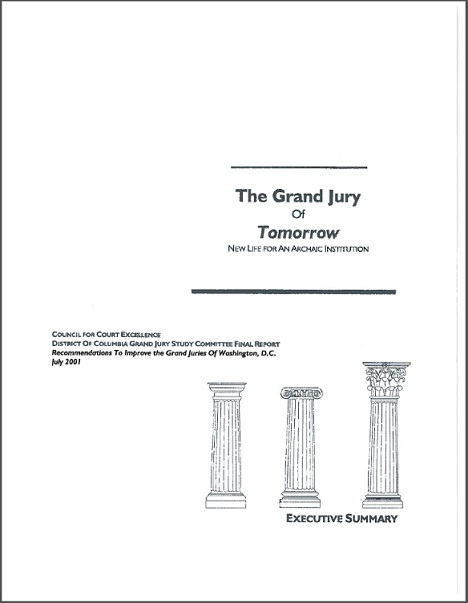 An Executive Summary of The Grand Jury of Tomorrow, New Life for An Archaic Institution publication. Please call 202.785.5917 to order over the phone. Report summary and recommendations of practical strategies to increase DC public safety and save taxpayer dollars. Please call 202.785.5917 to order over the phone.